As political attention has shifted from a potential U.S. military strike against Syria to a potential agreement on the dismantling of Syria's chemical weapons arbitrated by Russia, all eyes are on the United States, the Middle East, and key actors in Europe. But what has been the reaction in other parts of the world? In Latin America at least, which holds two rotating seats on the UN Security Council, the reaction reflects the wariness of a region long beset with U.S. interventions of its own. By and large, Latin American nations have opposed a military operation against Damascus. Regional blocs like the Union of South American Nations (UNASUR) and the Caribbean Community (CARICOM) have passed resolutions calling for negotiations and a cessation of hostilities. A leading opponent of the "military option" is Argentina, which along with Guatemala currently represents the region at the Security Council. Throughout the years of conflict in Syria, Argentina has maintained an anti-intervention and anti-military approach regarding the international community's involvement. Specifically, the Argentine government has pushed for dialogue between the warring parties within Syria. Hector Timerman, the Argentine minister of foreign affairs, notes that his country has proposed initiatives such as "a weapons embargo, humanitarian assistance, and an emergency meeting of the General Assembly" to address the ongoing violence. Allegations that the Syrian government used chemical weapons against civilians did not sway Buenos Aires' stance. In August, Timerman declared that "Argentina will never propose or support a foreign military intervention. The Argentine people will not be complicit in new deaths." An August communiqué released by his ministry emphasized that "for the Republic of Argentina, the conditions are not present for a foreign military intervention since in spite of the time that has passed and the hundreds of thousands of victims, all the mechanisms established by international law have not been utilized." In early September, Argentine President Cristina Fernandez de Kirchner met with UN Secretary General Ban Ki-Moon during the G-20 summit in Saint Petersburg, Russia. She reportedly proposed to the UN leader that the chancellors of the 15 member states on the Security Council travel to Syria to see if a ceasefire could be achieved. At the time of this writing, no further development has been reported on this proposal. Argentina's opposition to military intervention in Syria fits with its previous history of keeping out of foreign conflicts. Ariel Gonzalez Levaggi, executive director of the Centro Argentino de Estudios Internacionales (CAEI), a foreign policy think tank in Buenos Aires, explained that "Argentina has a tradition of neutrality that was modified in the 1990s but has continued during the era of Kirchner rule. The Argentine government was against the invasion of Iraq, the attack against Libya, and now Syria." It is worth noting that some Syrian expatriates in Argentina occupy positions in governmental offices. The extent to which this Syrian community is influential enough to affect Argentine foreign policy is under debate. In early September around 50 members of the Syrian community in Buenos Aires protested against U.S. military intervention outside the Syrian embassy. Some Argentine analysts have declared that escalating the war in Syria could have detrimental effects for Argentina, particularly in terms of energy. In a September 7 article published in the Argentine daily La Nación, experts explained that an expanded war could increase the price of oil, which would hurt the South American state's already dire economy. One analyst explained how, since 2009, Argentine exports to the Arab world have grown by 20 percent, and prolonged warfare could hurt Arab countries' demand for Argentine exports. 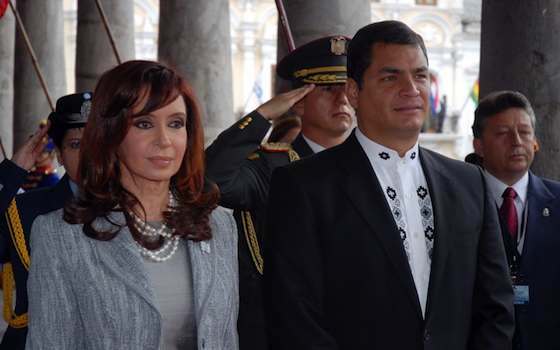 Argentina's anti-intervention stance is in line with the positions of most other South American governments. At a UNASUR summit in Suriname on August 30, they signed a declaration condemning "external interventions" in Syria and calling for a peaceful resolution to the conflict. CARICOM's Secretariat passed a similar resolution in early September, condemning the use of chemical weapons in Syria but also urging the international community not to engage in military actions against the Assad regime. Not all Latin American nations share this view, however. Guatemala, which holds the region's other Security Council seat, has openly expressed its support for U.S. intervention in Syria. "We clearly and definitely support the decision that the U.S. president has taken so that chemical weapons, which cause mass deaths, will not be utilized again," said President Otto Perez Molina on September 1. "That is Guatemala's position." It is unsurprising that Guatemala is siding with Washington, as the country's government has long had close relations with the United States. Guatemala receives significant amounts of aid from Washington ($110 million in 2011 and an estimated $95 million in 2012) and wants to see this kind of assistance continue. Agreeing with Washington's foreign policy decisions is an easy way for the country's right-wing government to maintain ties based on security initiatives (like Operación Martillo) and trade (CAFTA). As a representative on the UNSC, therefore, Argentina has been accurately reflecting the stance against military intervention held by other South American and Caribbean governments. This fits with the country's drive to forge a regional politics more independent of Washington. Guatemala's stance, by contrast, harkens back to an earlier era when Washington's dictates largely set the tone for the hemisphere. Nevertheless, the final point that needs to be addressed is whether Argentina, or even a united South America and Caribbean, have had any relevance in the decision making process in Washington, Beijing, London, Paris, or Moscow regarding intervention in Syria. The short answer is no. In Syria, Buenos Aires, Lima, Montevideo, and Kingston have had little influence (or none at all) in what the powers-that-be have decided. While the aversion of Western military strikes on Syria may be considered a relief, the way it was achieved exemplifies how little weight agencies like the United Nations—and particularly the non-permanent members of the Security Council and the Global South in general—continue to have in global security affairs.